I have sent the following letter to Timbuk2. About 3 months ago I achieved my life long dream of owning a timbuk2 bag. I had long watched, and planned for the day when my computer would be protected by the best bags in the industry. Pining away, I began to dream of the quality, the unparalleled craftsmanship and the utmost attention to detail and style. Surely, with this bag I could be successful, my wife would love me more, my coworkers offering me more respect. Even my community would finally recognize my achievements. After I got my bag, I rejoiced. These were the halcyon days. The sun shone through the darkness of winter, piercing and warming my heart with epic success. With my timbuk2 bag in hand there was no stopping me. And then the darkness fell. I still remember that day, I went to pick up my bag by it’s handle and in horrific slow motion it snapped. I looked on in horror, disbelieving that my golden fleece would be so taken from me. It is with a somber heart and forlorn eyes that I look to you, harbinger of hope. 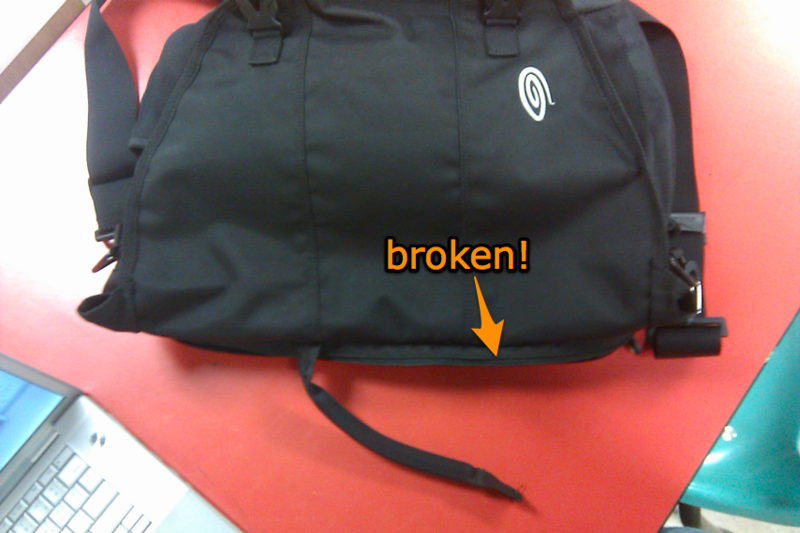 May my bag be repaired? Is it covered by warranty? It is the answers to these questions that brings me humbly before you. People are always coming up to me and asking “How is it that you never get tricked on April Fools day?” The answer is simple! I make a desktop background that reminds me that nothing I see or hear is real, sort of a one day mind bend toÂ solipsism! Anyway, you can download the background below! Or check out last years. 9:55:45 AM Dan: who’s the fanatic? You aren’t willing to say three simple words to solve your problem? 9:56:57 AM Dan: Its very easy, just say it and I’ll help you. I found a bug in time machine, at least on my machine anyway. For those of you that don’t know what time machine is it’s the backup software built in to OS X. With my recently acquired 1 terabyte HDD I thought I was all ready to start doing backups. I was wrong. It’s sad but Time Machine appears to cause all my USB 2.0 ports to slowdown to 1 MB/s which is actually slower than my internet connection. That means transferring files is a CRAZY huge pain which is funny because that’s the only thing an external hdd can possibly be used for. When I first discovered the problem I searched around Google a little bit but was so frustrated I decided to call Apple. Normally I just read the literature and fix my problems my self. But I was in a hurry and I couldn’t find anything quick and I was so mad at my computer that I just wanted to have it solved. While the guy on the support line was polite he couldn’t help me because I’d had my computer more than a year. His solution was to open up a support line for $45 or schedule an appointment with an “Apple Genius.” I grumbled never mind and hung up. I got a survey in my email from Apple wondering how my tech support phone call went. I told them horrible and that I was dissatisfied; not because of the tech support rep but because of the policy. Quickly, I forgot about the whole thing and just stopped using Time Machine (that seems to fix the problem). To my surprise Apple called me yesterday about the survey. They saw that I was very dissatisfied and wanted to see what the problem was. I told them that I understood the policy that I can’t get support because my purchase is more than a year old but that it seemed to me that because I had never asked them for anything, not even a single phone call, that it would be nice to get the help I was looking for. I’m a really low maintenance customer for just about everything, I do all my troubleshooting by myself or using “the google” and I don’t require much out of Apple other than that my computer work. Because of that I sort of feel like the one time I call, regardless of how long it’s been since I bought my product, I ought to get a little help. “Steven” the apple guy that called me, told me he thought it was a good idea and that it might shape policy in the future (I know, I know, that’s like getting a winning banner ad on the internet; but still it made me feel good). He even went through the trouble of sending me some more literature on my problem.